Nike: A Company Conservatives Should Love to Hate? Nike's recent decision to sign a multi-million dollar advertising deal with Colin Kaepernick caused many industry observers and ordinary Americans to scratch their heads. Kaepernick is the disgraced former NFL quarterback who caused incalculable damage to the League's brand and reputation by starting a protest movement centered on his decision to kneel during the singing of the national anthem. Kaepernick brought considerable media and public attention to his cause, which is to oppose what he regards as rampant racism and police brutality, but he did so at the cost of dividing Americans on the question of patriotism versus free speech. Even President Trump weighed in on the kneeling phenomenon, counseling the NFL to fire any player who refused to stand for the anthem. NFL attendance and viewership suffered in 2017, at least partly because of the controversy. Why, then, would Nike embrace a toxic personality like Colin Kaepernick? Conservatives must be asking themselves: is Nike a hotbed of liberalism? Are its executives card-carrying members of “the Resistance”? Do so-called social justice warriors populate its cubicles? In short, does a consistent left-wing bias explain the Nike-Kaepernick alliance? The answer, incongruously, appears to be no. Long-time Nike Chairman (and co-founder) Phil Knight has been a frequent donor to Republican candidates, and the company's own political action committee, based on recent filings, carefully calibrates its contributions to achieve rough parity between donations to prominent Democrats and Republicans. Meanwhile, many large corporations have become famous for promoting an agenda of political correctness, or for persecuting conservative employees, but Nike is not prominent among them. In fact, Nike has been remarkably successful at avoiding political controversy, and to the extent that it is criticized by politicians, it has more often attracted flak from the left rather than the right. Bernie Sanders, for instance, has criticized Nike for shipping jobs overseas, and in 2015 he advised President Obama not to visit Nike headquarters in Beaverton, Oregon because of the company's record of outsourcing and of tolerating the mistreatment of workers in its “sweatshop” manufacturing facilities overseas. Nike may be unpopular with some left-wing purists, therefore, because of various labor and environmental concerns, but conservatives have rarely had a beef with the company. In the short term, this thinking appears to have been vindicated by a significant boost to Nike's online sales. On the other hand, Nike's stock price fell, and preliminary data shows that Nike's “favorability” ratings are way down. Whether Nike's cynical calculus will stand the test of time, and the company will benefit financially from its alliance with Kaepernick in the long-term, remains to be seen. 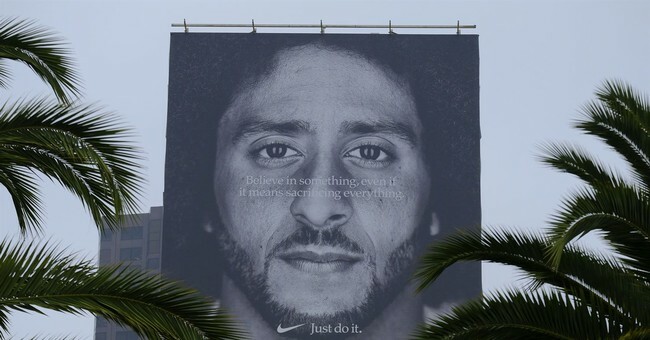 The lesson in the Nike-Kaepernick saga for conservatives appears to be this: sadly, in recent years, we have seen protests, boycotts, and online bullying and pressure campaigns become shockingly mainstream. Whereas in the past many individuals, companies, and organizations would make a considerable effort to appear non-political or neutral (and, incredibly, awards shows used to be about the awards! ), now the politicization of virtually every phase of public and private life, including leisure activities, has become difficult to avoid. For companies wishing to steer a middle course and avoid offending either liberals or conservatives, this has become virtually impossible, as extremists on both ends of the political spectrum adopt the attitude that “you are either with us or against us.” They increasingly demand that companies, organizations, and public figures shun, and even affirmatively condemn, the evildoers on the other side. That has become the price of maintaining one's existing market share, in many cases. Nike, it seems, reached the conclusion that, in the increasingly acrimonious and hyper-politicized world of sports, it was better off taking an aggressive stance in favor of Kaepernickism, and against racism, than it would have been staying on the metaphorical sidelines. Indeed, had the company adopted a more cautious, conventional approach, it would have risked the possibility that its more activist rivals would outshine it. Nike, lest we forget, was not the first sports apparel company to take a political stand, nor will it be the last. Conservatives, unfortunately, had better get used to this trend – and they would be wise to respond pro-actively by adopting many of the same pressure tactics already employed by left-wing activists. Otherwise, they may wake up someday to find that corporate America has become leftist by default, and conservatives are just as unpopular in corporate boardrooms as they are in newsrooms and university lecture halls. Say what you will about Kaepernick, but at least he's in the game – the game of politics, if not the game of football. But football, apparently, was never his passion to begin with.